What is Black Magic? Why shouldn’t I do it? Why won’t The Green Man staff do it for me? Disclaimer: This is my opinion. You are free to disagree. First off, please know that the term “black magic” is not racist. It is an old term that has nothing to do with race. For me, the term is a kind of shorthand, since it is a recognized term, thanks to books and movies and the Internet, and it refers to intent. It is work you feel you ought to keep in the shadows rather than work that you, as an ethical person, are proud to do in the light of day and in public. Essentially, black magic works on someone else’s free will or works to give you power over someone else. We at The Green Man feel this is unethical, and we won’t do it. (And we don’t call what we do “white magic” although some people do.) I’d prefer calling what we practice “ethical magic” vs. “unethical magic” but as I said, “black magic” is a handy and well-known shorthand. Some people call it “low” magic as opposed to “high” magic–but then some consider ceremonial magic “high” and all other practices “low” regardless of intent! “What’s so wrong with making him fall in love with me/making her move away/breaking up that couple/getting him fired?” So many things. First, it’s unethical. Second, once you open that door by working that way, you have created a pathway THAT GOES BOTH WAYS. You are now open and vulnerable to the same kind of work to be done against you. We have met folks who work this way, and they have become slaves to the candles and the jars and the pictures and the poppets–slaves to the spells they’ve done, because if they let up on their attacking energy, it can come back at them. They spend a third of their time on the offense and the other two-thirds on defense against those they’ve thrown a whammy at. Is that really the kind of coin you want to pay? Over and over and over and over and over? And third, it’s unethical. Oh, did I say that already? Good. Also, you know the phrase “Be careful what you wish for”? Boy, can that apply here. We’ve seen love spells aimed toward specific people produce not lovers, but stalkers. And undoing a spell is much harder than doing one! By this time you might be wondering, “Well then, what good is magic? What *can* I use it for?” You can use it to give a boost to things in your life you are already working on: prosperity, love (but not aimed at a specific person), getting a job (but not getting someone else fired), boosting your career (ditto), court justice, house blessing, general uncrossing, etc., not to mention the personal work that helps your spirit evolve. And self-evolution is what we like to promote at The Green Man! Magic doesn’t have to be spells. Magic is also communing with the spirits. Talking with nature. Getting messages from spirit guides, patron deities, archangels, whatever entities you work with. Learning and growing. The store received an email from a woman asking if there was a mojo bag we could construct to make a man she was dating see her more often and give her the gifts he kept promising. I explained that this was black magic as it would work against the man’s free will, and I said it was unethical and we would not do that. I said we could do work to draw the right man (who may or may not be that guy) to her and to bring her prosperity. She wrote back, asking if I knew anyone who did black magic that I would recommend. (Cue the eye roll.) Uh…no, sorry. So these are my thoughts on “black magic” – as I said, you are free to disagree, but I hope you will give thought to the coin that will be exacted from you. There’s always a coin…. 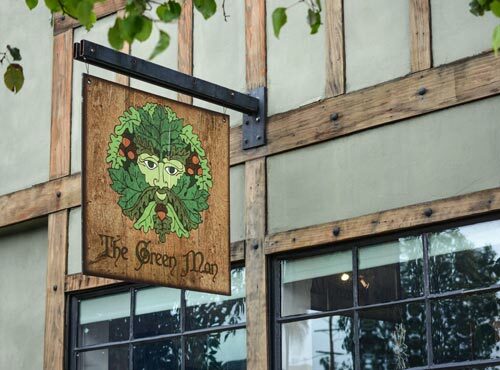 Each Blog is the unique expression of the Blogger & does not speak for The Green Man as an entity, but rather is one of the many diverse colours that make up our Green Man Tribe. For more information, click here.